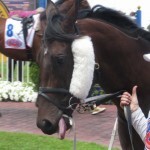 I tried to photograph the bad behaviour of the favourite in the two-year-old race, Miracles of Life, but every time I pressed the shutter she put on her best manners. All I got for my troubles were pictures of the horse with her eyes shut or else lobbing along with her head down. I could never back her because of the unsettled behaviour and the struggling strapper, let alone the cross-over noseband. 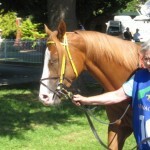 But today I was prepared to forgive the noseband since I’d seen her win with it before. 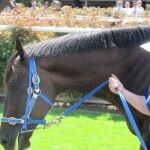 The horse is barely bigger than a pony, but has certainly turned out to be a pocket rocket. And in the end it was all too easy for All Too Hard. Too short to bet the place, but simply too good. 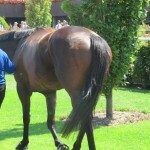 And you’d have to say that Black Caviar’s brother’s backside does bear a certain resemblance to his half-sister. Compare it with the rocket! I kicked of with a loser, Tan Tat Rock, how I hate that, and then two placed horses, Meliora and Star of Giselle, to save the day. There were heaps there. Fans galore. 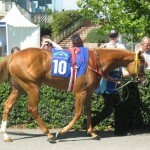 So many that I couldn’t see her saddled up in the stalls, let alone in the mounting yard. 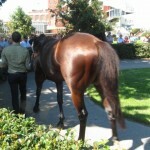 I’ve never seen so many around the yard, not even on Cup day. How I love the mobile phone salute! But I’m still struggling to understand it all. I mean, a horse is just a horse. 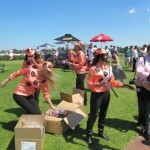 And they all went home after the race and didn’t even have to collect at the tote because they didn’t bet. They just want to be a part of history. But I was there too. A part of history. Congratulations to Pete on the trifecta and the new course record. There have been quite a few small fields lately, but today takes the cake. The main race has only one starter! 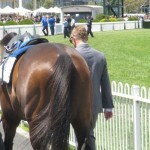 There were heaps there, trying to get a look at that backside again, maybe for the last time. It still looks pretty powerful and the horse strode out quite well. 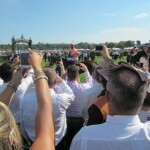 In fact the horse, Black Caviar, beat nothing and won in a hand canter. Could be worth following. The doyen of horse watchers, Les Carlyon was there, and thought the mare had probably been spending a bit of time out in the sun as her coat colour seemed slightly lighter. And maybe she could still lose a few kilos, although there are still a couple of weeks to go till the Lightning. I asked Les if he would keep on racing her and he said he would. She can only produce one foal a year whereas a stallion can produce a hundred. And they all have to lose sometime. No point in just trying to keep the record intact when you’ve got a good one. Not much else to report. An interesting gear combination of cross-over nose band, tongue tie, and winkers on the unraced two-year-old colt Present Glow. No wonder he was lolling his tongue. You’d think he could have a run or two first before loading him up with stuff. And only two bets for two collects on two winners, Winta Chiller and Future Solution. 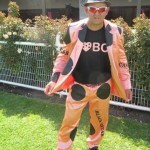 I was going to back The New Boy, but $1.30 the place was a bit short, so Future Solution ended up solving my problem. Second week in a row!